The Ministry of Information is a branch of the Government of Bangladesh is the apex body for formulation and administration of the rules and regulations and laws relating to information, broadcasting, the press and films in Bangladesh. It is responsible to release government information, media galleries, public domain and government unclassified non-scientific data to the public and international communities. The Bir Sreshtho, is the highest military award of Bangladesh. It was awarded to seven freedom fighters who showed utmost bravery and died in action for their nation. They are considered martyrs. Bir Uttom is the second highest award for individual gallantry in Bangladesh after the Bir Sreshtho and the highest gallantry award for a living individual. Bir Bikrom is the third highest gallantry award in Bangladesh. Like the other gallantry awards, this was introduced immediately after the Bangladeshi Liberation War. Bir Bikrom was awarded to 175 fighters. Bir Protik is the fourth highest gallantry award in Bangladesh. Bangabhumi also known as Bir Bongo, is a separatist movement to create a Hindu country in southwestern Bangladesh, envisioned by Banga Sena. Farida Akhter is a Bangladeshi film actress. She is best known for her performance in Satyajit Ray's Distant Thunder, a novel adaptation about the Bengal famine of 1943, which won the Golden Bear prize at the 23rd Berlin International Film Festival in 1973. She was active in the 1970s through 1990s as an actress in Bangladeshi films. Awards and decorations of the Bangladesh War of Independence were decorations which were bestowed by the government of Bangladesh through official Gazette of December 1973 along with the official list of sector commanders. The third Sheikh Mujib cabinet was the first elected Government of sovereign and independent Bangladesh, was formed on 16 March 1973 after the Bangladesh Awami League won the 1973 general election with a vast majority..
Bangladesh Academy of Sciences is an academic forum for Bangladeshi scientists and technologists. Established in 1973, it aims to fulfill the role of promoting research and development of sciences in Bangladesh. Sylhet-5 is a constituency represented in the Jatiya Sangsad of Bangladesh since 2019 by Hafiz Ahmed Mazumder of the Awami League. Chittagong-5 is a constituency represented in the Jatiya Sangsad of Bangladesh since 2014 by Anisul Islam Mahmud of the Jatiya Party (Ershad). 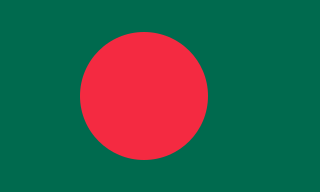 Dhaka-1 is a constituency represented in the Jatiya Sangsad of Bangladesh since 2019 by Salman F Rahman of the Awami League. Chittagong-1 is a constituency represented in the Jatiya Sangsad of Bangladesh since 2008 by Mosharraf Hossain of the Awami League. Chittagong-2 is a constituency represented in the Jatiya Sangsad of Bangladesh since 2014 by Syed Nazibul Bashar Maizvandary of the Bangladesh Tarikat Federation. Mymensingh-5 is a constituency represented in the Jatiya Sangsad of Bangladesh since 2014 by K. M. Khalid of the Awami League. Mymensingh-8 is a constituency represented in the Jatiya Sangsad of Bangladesh since 2014 by Fakhrul Imam of the Jatiya Party (Ershad). Mymensingh-9 is a constituency represented in the Jatiya Sangsad of Bangladesh since 2014 by Anwarul Abedin Khan of the Awami League. ↑ Rahman, Syedur. Historical Dictionary of Bangladesh. Scarecrow Press. p. 306. ISBN 9780810874534 . Retrieved 9 October 2016.